Tis the season for Christmas trees – and Kale. 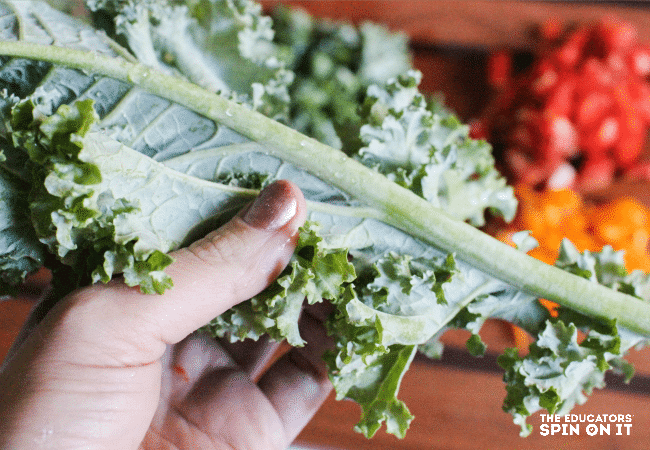 Yes, Kale is a fabulous winter garden vegetable. It is prolific and grows well, which means, we are eating a lot of it. 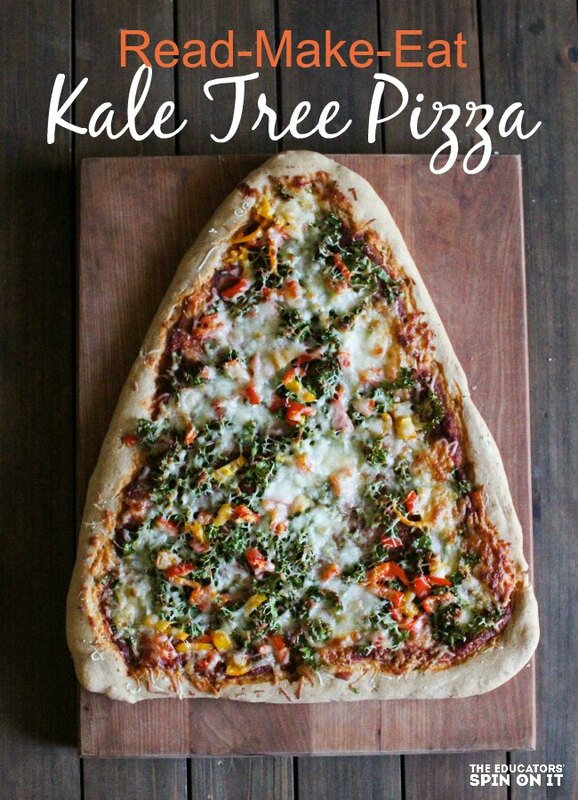 Snuggle in and read a few good Christmas tree books with your little one, then head to the kitchen and make this kale pizza tree recipe together. It’s a fabulous after school activity that helps bring literature to life and get dinner made! Read a few Christmas Tree books with your child. Talk about the similarities and differences in the trees. Do all of them have ornaments? Are they the same colors? Is the story in the same setting in each book? 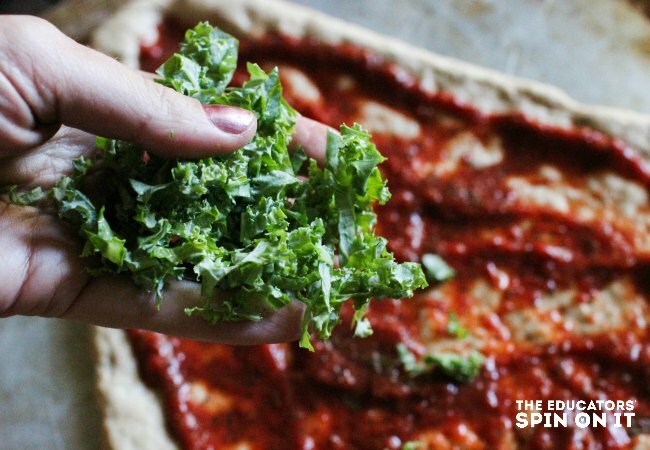 Then, select one of the trees from the book to make into a kale pizza tree! Head to the kitchen and start baking! Dough. We use the recipes from the The Best of Byerly’s: A Recipe Collection I really like their whole wheat crust one, but my 7 year old said it tastes too healthy. He prefers the all white flour option. Sauce. A gentleman sells the most fabulous homemade tomato basil pasta sauce at our local farmers market. I use this for my pizza sauce too. Cheese. I prefer to use Monterrey Jack and fresh grated Parmesan cheese. 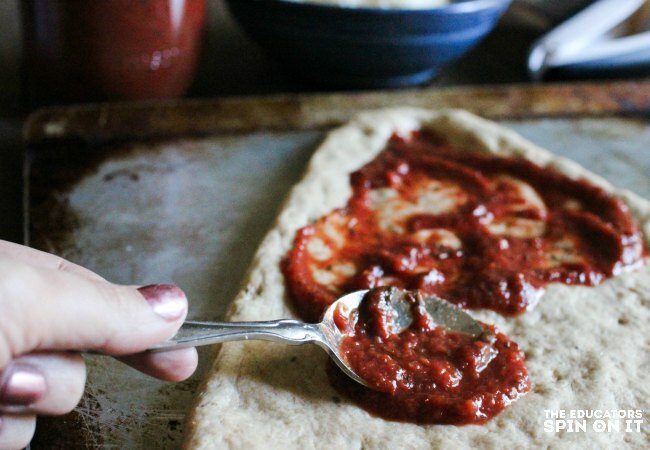 First, make or buy your favorite pizza dough. While your dough is rising, wash and cut the vegetables. Remove the rib on the kale. That is the thick, tougher part that extends from the stem into the leaf. This part needs more cooking time. For this recipe, I just use the tender leaves. 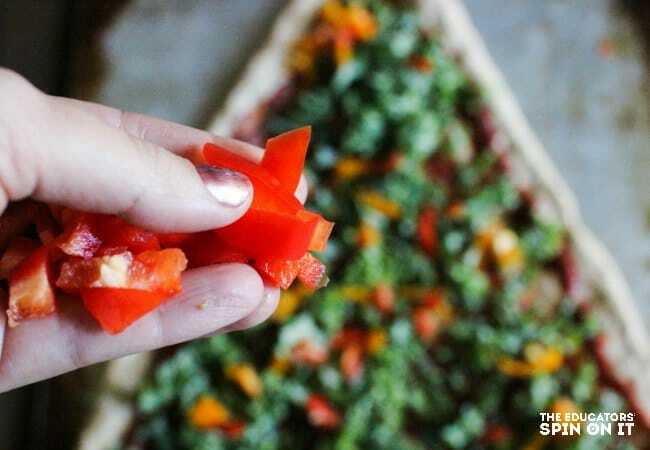 Chop the peppers into bite size pieces. Then, heat your oven to 425 degrees. Lightly grease your baking sheet. Sprinkle with a touch of cornmeal if available. Next, separate the dough in half. Roll each half into a ball. 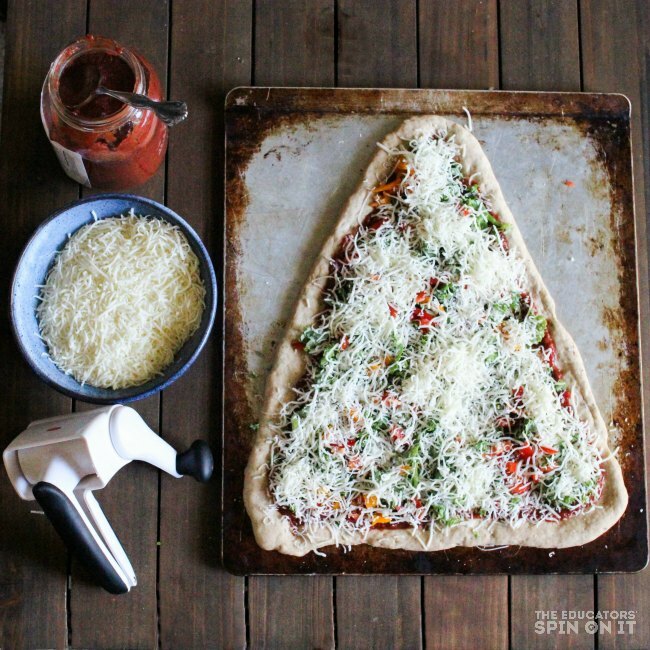 Press the dough on the baking sheet in a tree shape. Keep it simple, a tree with lots of branches will bake unevenly. Spread the sauce on the snowman to your desired constancy. Next, decorate the tree with pepper pieces. The kids call these ornaments. The crusts should look lightly browned. Use a spatula to check the underneath the middle crust to make sure it doesn’t look soggy. If it does, bake a few minutes longer. Don’t forget to set your timer! Last, but not least, let it cool, eat and enjoy. Purchase ready made dough in your deli selection. Use a bread machine to knead your dough. Make the dough up to two days ahead of time. refrigerate. Let dough stand at room temperature for 2 hours before shaping. Pre-bake crusts. Store in the freezer. Pull out, top and bake later. I don't know what kale is or candy coating… But I want to eat it all! Looks fantastic and I'm impressed! Merry Christmas! Oh Robyn – I will get another Kale post up just for you =) and candy coating is my new favorite baking fun. Cake pops, dipped pretzels, and candy cane popcorn are just a few ways to use it! Yum, it all sounds so good. You are so creative with cooking ideas! One of my New Year resolutions is to eat more leafy vegetables next year. That kale tree looks wonderful! We made some Christmas shaped pizzas for our Christmas Eve dinner. 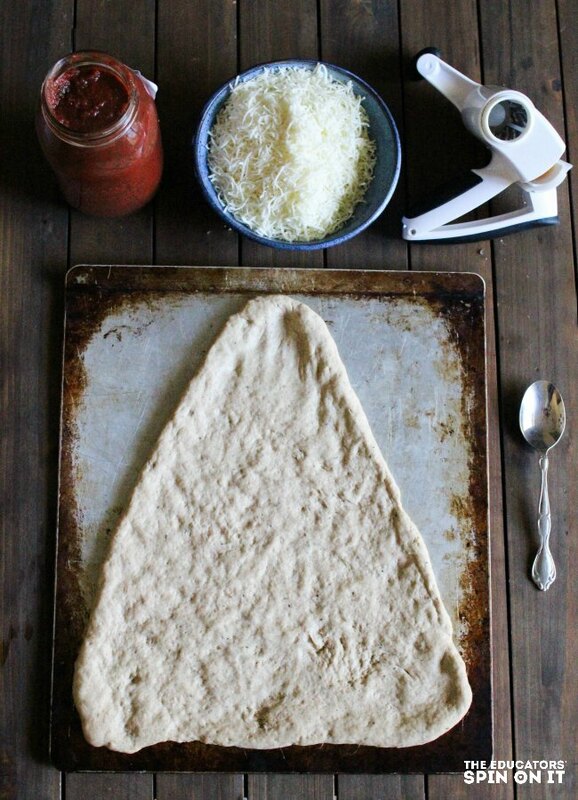 You can never go wrong with homemade pizza and the shapes make it extra fun.